GAINESVILLE, Fla. – Florida residents and visitors have a new resource to help them prepare for destructive storms and other emergencies. 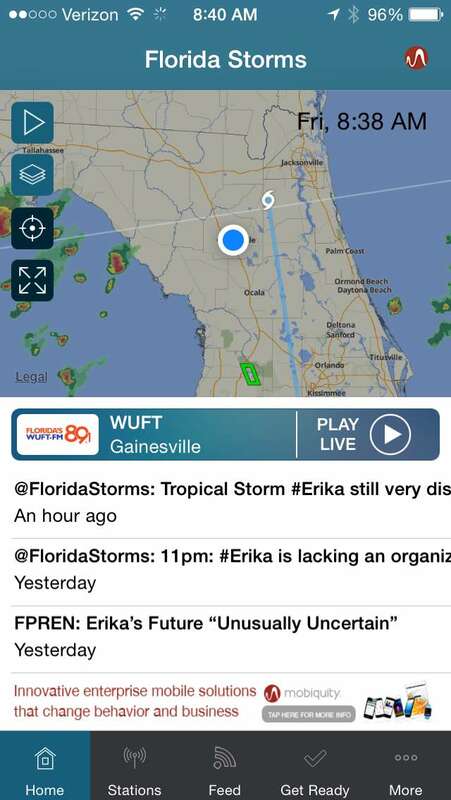 The Florida Public Radio Emergency Network (FPREN) today launched Florida Storms , a free, mobile weather application that offers a simple way to stay informed of potential weather and other hazards, backed by real-time credible information from the nearest Florida public radio station. Using a combination of state of the art weather tracking and forecasting technology and the expertise of staff meteorologists at WUFT-FM, the University of Florida College of Journalism and Communications public radio station and host to the FPREN StormCenter, Florida Storms helps deftly navigate weather-related emergencies, from preparedness checklists to storm updates to evacuation routes. FPREN communicates emergency information statewide through a seamless system of free over-the-air FM radio stations. The new mobile app extends the reach of the Florida station network with reliable and immediate accessibility on weather developments. The iOS app, now available free in the Apple App Store, was developed in collaboration with mobile engagement provider Mobiquity. An Android version will be ready early this fall. Push notifications: Customizable, from the National Weather Service and the National Hurricane Center. Florida public radio stations joined forces with the Florida Division of Emergency Management to form FPREN in 2014. The FPREN Storm Center is operated by WUFT-FM at the University of Florida’s College of Journalism and Communications providing local 24/7 weather, data and storm updates to all stations in the network. FPREN stations collectively cover 99 percent of the state and are locally staffed and equipped to stay on the air even during times of massive power outages in order to deliver important information to local audiences before, during and after an emergency. In the event of a weather incident, the FPREN stations will continue to provide recovery information for as long as necessary. Working in partnership with the Florida Division of Emergency Management and local Emergency Operations Centers, listeners and users of the mobile app can be assured of having access to the most up to date information. FPBS is a non-profit association of public radio and public television stations in the state of Florida. As the largest broadcasting network in the state, we reach more than 99 percent of Florida’s population through traditional broadcast, online tools and community engagement. FPBS stations are a state partner in education, emergency management and public affairs. Through our collaborative efforts, we identify and implement regional and statewide projects that enhance and sustain community initiatives that serve the citizens of Florida. For more information, visit the FPBS website at www.fpbs.org.